The UN predicts many meters of sea level rise due to an increase of 0.0001 mole fraction CO2 over the past century. If you believe them, please contact this realtor and take appropriate action. Keep up the inspirational work, Tony — I first heard about your site through KFI radio in LA, via the John Kobylt and Ken Chiampou program several years ago. How wonderful ! Prince Charles , the UK green prince bought 30 years a property at Vero Beach on orchid Island , famous for its grapefruits of unchallenged worldbest quality to install a training-ranch for his polohorses . Most of the grapefruit-groves were sacrified to the holy grail of prince charles and he used the rich sandy soil to train his horses . I have nothing against it , but the property was at the most 3 foot above high water 30 years ago and nothing has changed there in the meantime . There is much interest for a location there that the value of the land has exploded there during the last 30 years . The superrich donot believe a word of the cagw scam , but it is used as a tool to control society . Trump is not so exceptional , he bought also oceanfront property in Florida , but he is showing to be more honest . 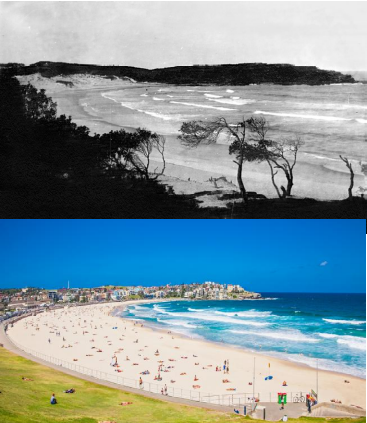 I wish my great-grandparents had bought some oceanfront property at Bondi Beach, Sydney in 1875. Last January it was cold and windy with not a sole on the beach the day we visited. Love it! Ocean front property in Arizona. Wonderful. It all depends how far you want to go back. Never can go wrong with some George Strait. Arizona had plenty of ocean front property during the cretaceous.